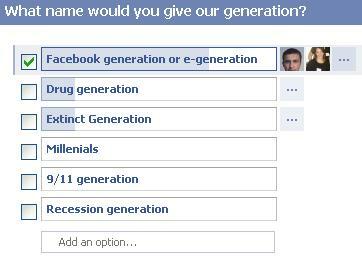 Becoming the Facebook Generation: What Defines Us? With the 10th anniversary of the 9/11 attacks came the predictable flurry of “where were you when” stories – seemingly everyone has one, and with good reason. 9/11 was surely one of those defining events that changes the way people look at the world and at their fellow human beings. And the decade anniversary got me thinking: sometime soon our generation is going to run the world, and the way we take on that challenge will be molded by the experiences we’ve been through. What will those experiences be? How are they different in different countries? And will they put us in a good position to be the world’s shepherds? 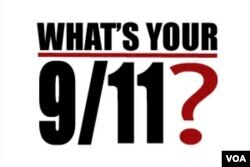 The What’s Your 9/11? project, which we ran along with our parent organization, the Voice of America, was created to explore exactly those questions. Our goal was to build a living database of the events shaping our generation, as seen through the eyes of those who experienced them. We opened the question to young people across the globe, and received responses from Bolivia, Armenia, Pakistan, Australia and everywhere in between - every continent except Antarctica, in fact. And, unsurprisingly, they covered a wide range of experiences, which we plotted on this nifty timeline (zoom in or click the + signs to see more). The most cited event was 9/11 – 27 different people talked about the 9/11 attacks as a moment that defined their lives. Despite discussing a wide range of events, the stories we got showed the universality of human emotion as well. People described how dramatic experiences not only shaped their worldviews, but also crept into their daily lives in unexpected ways - for many, major events created new anxieties, or new habits. 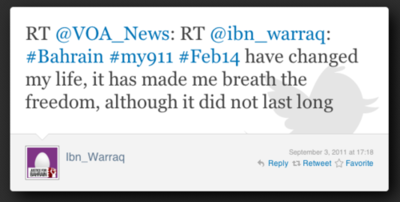 So what are the lessons we are collectively taking away from these experiences? Are they making it easier or harder for us to understand each other and work together to make a better world? Certainly the stories illustrate how dramatic experiences create new fears and worries – sometimes about other people or whole cultures. They also show a determination among many to make things better in the future. But in the end, what this project really showed is our sense that we don’t think any of these experiences are what will shape us most. and time again when we asked, on the Facebook page and in forums, what will most define our generation, the response was that we will most be defined not by our differing dramatic experiences, but by our shared experience of growing up in a time of rapid technological change. 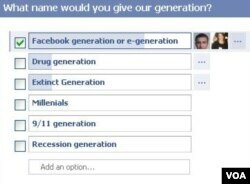 We won't be the "9/11 generation" or the "Arab Spring generation" - we're the "Facebook generation," and for better or worse, we are proud of that.